DinoTrux are trucks that are dinosaurs. There is a tv show based on these books. I like dinosaurs and trucks so this is awesome. There are people in the books but that isn’t real. It’s funny though. 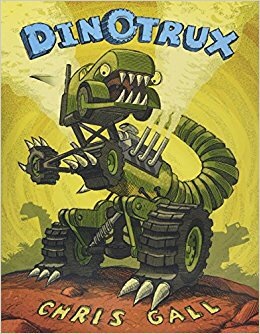 The book talks about the different DinoTrux. My favorite one is Cementosaurus and Blacktopadon. I like that the dinosaurs cause trouble. The pictures are funny. I can read some of this by myself. Everyone who likes Dinos and trucks will like this. I think it would be fun if real work trucks were painted to look like the dinosaurs. My son loves this show!